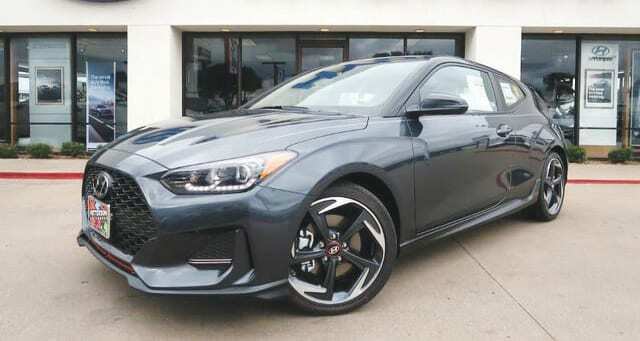 Begin the New Year in a fast, efficient, and sleek 2019 Hyundai Veloster. The interior’s been completely revamped with a cabin that’s more driver-focused and modern. There’s a heads-up display that projects key driving information closer to eye level, the available pop-up HUD keeps you focused on the road ahead. Handling agility’s been upgraded, with sports-tuned suspension offers multi-link rear suspension, while Torque Vectoring Control boosts cornering grip and stability. Manual or Automatic? Can’t make a choice? With the new Veloster, you can have both. The vehicle offers the dual benefits of automatic and manual with the Dual Clutch Transmission (DCT)with wheel-mounted paddle shifters plus, there’s a 7-Speed Dual Clutch Transmission. Open up the door and let the fun begin, with the 6-way adjustable driver seat with seat height adjustment Power lumbar adjust for the driver’s seat. Adjustable 60/40 split fold-down rear seatback features adjustable head restraints. The Veloster’s fully decked-out in the back with a rear spoiler and diffuser, available LED tail lights, and dual center-mounted exhausts with chrome tips. Among the ample list of safety features, is the Veloster’s Lane Keep Assist. In case of an unintended lane departure at higher speeds, it warns the driver and – when necessary – guides the car back to a safer position.